The tenor, Rumen Doikov, was born in Sofia 1 May 1951. After singing in the famous children's chorus Bodra Smiana, he attended the State Academy of Music as a student of Konstantin Karapetrov and graduated in 1977. In 1978 he joined the Sofia National Opera and debuted there in November 1979 as Hoffman in The Tales of Hoffman. He has since been the leading tenor of that company. In 1979 he continued additional studies in Weimar with Pavel Lisistian and in 1982 was a prize winner in the Santa Cecilia Singing Competition. His first international appearances were in 1979 touring with the Sofia National Opera in Austria, France and Russia. Since then he has appeared as a guest in Belgrade, Wiesbaden, Brazil, Ukraine, Copenhagen, Malta, Russia and Turkey. 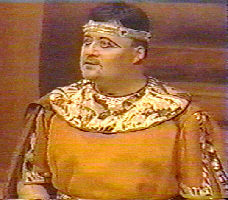 Singing in Holland in 1995 he performed the role of Radames 43 times in 46 days. In twenty years of singing he has sung in 118 performances of Aida and 136 of Rigoletto. His debut in the United States was in New Hampshire as Calaf in Turandot on February 1, 2000. His repertoire of over 46 major roles includes Radames, Manrico, Cavaradossi, Pinkerton, Pollione, Alvaro, Otello and Dimitri in Boris Godunov.